Selby into semis after epic frame - Joakim A.
I hope you didn’t miss the longest-ever frame of snooker broadcasted on TV yesterday evening between Mark Selby and Marco Fu. Lots of fun to watch them battle it out at the table. 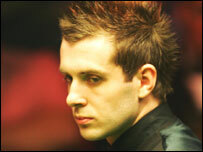 Now Selby will face O’Sullivan in the semi-final tomorrow. That’s going to be another interesting match.